. . .So I have told you many times. How did you like Flensburg? A fine town, is it not? Did you find Herr Krank, the carpenter? I see you have placed a little mizzen-mast. The rudder was nothing much, but it was well that it held to the Eider. But she is strong and good, your little ship, and—Heaven!—she had need be so.' He chuckled, and shook his head at Davies as at a wayward child. Erskine Childers was shot by firing squad during the Irish civil war in 1922. According to Wikipedia, his last words were a joke at the expense of his executioners: "Take a step or two forward, lads. It will be easier that way." This book (and the movie adaptation) was much loved in my family home. Childers wrote it pre-WWI and it's based on a sailing trip he took around the Frisian sands. 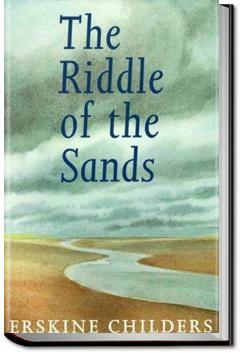 It's often credited with being the first spy novel, but The Riddle of the Sands was a rather dull affair. We follow two Englishmen in 1901 as they sail around Germany and stumble into a German plot. A bit misleading, the cover of this historical thriller. Initially thought that this novel was set in Egypt instead of the German Coast pre WW1. Found this to be a slow read indeed, had a "boys own adventure" feel to it.